"They're not just missiles we're going to be destroying, general. If we kill Soviet soldiers, they're going to respond. How would we respond?" October 1962. Two low-flying military jets swoop down over the green, swaying trees of Cuba with plans to photograph the military buildup in this Soviet-controlled country. Soldiers quickly gather to fire upon these enemy planes, and the pilots face mortal danger. However, the peril they encounter concerns much more than their own lives: If they're shot down, it could spawn a nuclear war that could lead to the end of human existence. During the tense Cold War era of Thirteen Days, the United States and the Soviet Union have reached a point of increased conflict that places the entire world in extreme danger. With the technological advances of nuclear weaponry, both sides possess the capability to decimate their opponent's population with a few swift strokes. This film chronicles the tumultuous events of the Cuban Missile Crisis in which President John F. Kennedy (Bruce Greenwood) nearly orders an air strike on Cuba. The United States has discovered the existence of hidden nuclear weapons in their Communist neighbor�an ally of the Soviet Union. These missiles would provide the Russians with the ability to destroy much of the United States with only a five-minute warning. After receiving terrifying photographs, Kennedy, his brother Robert (Steven Culp), and Special Advisor Kenny O'Donnell (Kevin Costner) must now decide on a course of action that could lead to mass destruction. It's amazing to realize how close the United States and the Soviet Union came to reaching a dire conflict. I grew up a long time after the Cuban Missile Crisis and possessed only a basic knowledge of its history before viewing the film. The story rivals the best fictional thrillers of recent years, and it's much more captivating because the events depicted actually occurred. While some dramatic license was obviously taken in individual scenes, the major moments are disturbingly accurate. In fact, some of the dialogue is identical to the statements taken from transcripts of secret meetings between Kennedy and the high officials of our government. Also, the atmosphere doesn't feel artificial, as if manufactured in a Hollywood studio. Instead, it transports us back to the intensity of one of the most pivotal conflicts of the 20th century. Kevin Costner is given top billing due to his star power, and he does not disappoint by providing Kenny O'Donnell with an impressive amount of emotional depth and intelligence. During conflicts between Kennedy and his advisors, he lurks around the outsides of the frame and contemplates each action. What makes this character interesting is its variation from Costner's "movie star" roles, in such bombastic films as The Postman and Waterworld. In essence, he plays a part usually reserved for well-known character actors like Tommy Lee Jones or Ed Harris. Although Costner has the recognizable face, the most intriguing performance comes from Bruce Greenwood (The Sweet Hereafter). His version of JFK contains the perfect combination of fortitude, ingenuity, and the grand stature necessary to make him believable. Kennedy realizes that his decisions will have a lasting impact on his country and the world, and Greenwood uses just the right demeanor to display the understandable strain on his mind. While his military advisors badger him incessantly and urge him to make a move, he lets them speak their piece, then responds swiftly and precisely. While he may not exactly resemble Kennedy, Greenwood inhabits the character's ideas and presents the young president's inner strength. I found it difficult to take my eyes off him throughout the film. Unlike the insulting historical recreation of Pearl Harbor , Thirteen Days treats its subject with great respect and sincerity. Director Roger Donaldson (No Way Out, Dante's Peak) avoids the trap that doomed Tora! Tora! Tora! at the box office by keeping the story dramatic and emotionally compelling. This is a character-driven piece that retains the humanity of the events and doesn't lose them in big-budget excess. The few action scenes serve the story and boast impressive visuals that fail to detract from the people involved. Writer David Self (The Haunting) has created an accessible script that will still charm historical experts and people who lived through this crisis. This film cracks on all cylinders and provides breathless entertainment throughout its lengthy running time. Image Transfer Review: New Line has followed their usual trend with Thirteen Days and released an excellent transfer. Presented in a 1.85:1 widescreen anamorphic format, this picture is virtually flawless and includes an excellent attention to detail. The images from the early 1960s (including some actual, restored footage) shine with bright colors and impressive clarity. The black levels remain solid throughout the film, and the action scenes look impeccable. Although much of the story takes place indoors in fairly simple rooms, this transfer remains at a premier level to the end. Audio Transfer Review: The 5.1-channel Dolby Digital transfer on this disc makes full use of all the speakers to create a wonderful viewing experience. Unlike many supposedly multiple channel tracks, this one really utilizes the rear sounds. When the emotions rise and the melodic score takes over, the music works very impressively to keep the actions moving. Also, the dialogue often features numerous people talking all at once, and the conversations are easily understandable and clear. The sound balances nicely and contains plenty of force during the flight scenes. Extras Review: Thirteen Days ranks on the same level as premier DVD releases like The Abyss and Fight Club. This disc represents a new form of release from New Line�the infinifilm�which has an even greater range of extra features than their Platinum Series. With the infinifilm process enabled, you may access a wide array of bonus areas while viewing the film. Choices pop up on the screen with each chapter and lead to video biographies, short segments from the full documentary, and other special features. While it contains much of the same material as other extras on the disc, they're combined into an easy-to-use form to create a remarkable experience. Also, subtitles often appear and add even more historical background to the scenes. I've witnessed this format before on discs like The Matrix in its "follow the white rabbit" bonus, but I know of nothing that is on this scale. Along with the infifilm options, this disc also features two excellent and completely different commentaries that convey a tremendous amount of insight into the production. The first track includes director Roger Donaldson, executive producer Michael de Luca, writer David Self, producer Armyan Bernstein, visual effects supervisor Michael McAlister, and actor Kevin Costner. All of the speakers provide interesting information about the film's creation, especially Donaldson and de Luca. Costner's words spring from a separate recording, and they focus on his character and what attracted him to the role. It's especially impressive to hear de Luca talk with passion and intelligence about the history of the piece and his motivations. Producers often present little more than technical background on commentary tracks, and he goes well beyond this trend. I found it intriguing that the original concept featured a love story that took place during the crisis; I'm glad they chose to focus instead on the key players of the event. This is an excellent and diverse track that covers extensive ground about all elements of the film. The second commentary includes a wide variety of speakers from interviews recorded in the 1960s and today. It features comments from President John F. Kennedy; Kenny O' Donnell; Sergei Khruschev, son of the Russian leader and Pierre Salinger, the White House Press Secretary at the time of the crisis. Everything is edited together nicely to provide a historical viewpoint on the story; each statement has an introduction that makes the track easy to follow and understand. The technical quality is impeccable, even with the older interview pieces. Kennedy's words are a treat and often correspond directly with the events occurring on screen. During his television announcement to the American public, his actual words are played on the audio track over the speech given by Greenwood in the film. This commentary is an amazing resource that complements the other one quite nicely. Roots of the Cuban Missile Crisis presents a complete historical picture of the crisis and all its pivotal moments. Featuring interviews with several professors, Sergei Khruschev, Sam Donaldson, and other experts, this new 48-minute piece provides a compelling and educational experience. It begins in 1946 and covers the background of events leading up to the discovery of missiles in Cuba. The Soviet side also becomes more understandable with Khruschev's words about his father's thoughts during this period. It's impossible for someone not yet born at the time of this crisis to totally understand the political climate, but this documentary helps greatly. 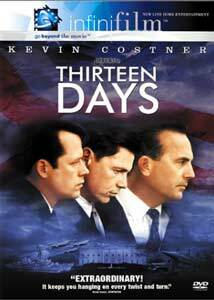 It also reinforces the accuracy of Thirteen Days, which corresponds perfectly with the material presented. Another compelling supplement is the collection of video biographies of nearly all of the major figures in the crisis. Separated into leaders, advisors, the military, diplomats, and the press, these brief segments work wonderfully for uninformed viewers who wish to learn more about the figures portrayed. While only a few of the biographies last even two minutes, the sheer volume of entries allows for a greater understanding of the people involved. The remaining extras follow the usual model for DVD special editions. Nine deleted scenes are included for a total of about 12 minutes of additional footage. All of them contain commentary by director Roger Donaldson about the reasons for their removal. None of them are ground-breaking, and most were cut for pacing issues. With the exception of a few shots, all of the scenes have impressive widescreen transfers. Bringing History to the Silver Screen is an 11-minute, poorly edited featurette with interviews placed together without a clear direction. However, the material is genuine and lacks the promotional fluff often inherent in this type of supplement. Much of the running time focuses on the production design and other members of the crew who perform the behind-the-scenes work on the movie. Another interesting feature covers visual effects and allows you to view the same scene in five different formats using the multi-angle button. Visual effects supervisor Michael McAlister provides a brief introduction. Finally, this disc contains cast filmographies and a 1.85:1 widescreen trailer. This preview also contains a 5.1-channel Dolby Digital audio track. Hollywood makes it easy to be skeptical about films that cover historical events. Writers often trivialize essential moments and convert them into dull dramatic soap operas. Thirteen Days has helped to restore my faith in this genre. It covers the Cuban Missile Crisis with remarkable accuracy and faith. Also, the story remains entertaining without sacrificing the true nature of the conflict depicted. Bolstered by an unbelievable collection of extra features, this disc is highly recommended.